DOUGHNUT HAPPY HOUR... 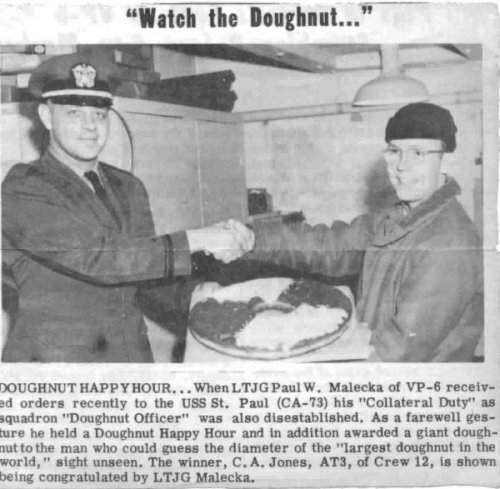 When LTJG Paul W. Malecka of VP-6 received orders recently to the USS St. Paul (CA-73) his "Collateral Duty" as squadron "Doughnut Officer" was also disestablished. As a farewell gesture he held a Doughnut Happy Hour and in addition awarded a giant doughnut to the man who could guess the diameter of the "largest doughnut in the world," sight unseen. The winner, C.A. Jones, AT3, of Crew 12, is shown being congratulated by LTJG Malecka.